When I think about acne, I flash back to my teenage years. I remember being so relieved when I finally entered my 20s. I had always associated acne with puberty until I broke out as an adult the morning just before a big photoshoot (because my body also has a sense of humor). Surely this was not the same kind of adolescent acne that surfaced in high school. So why was this happening now? It turns out there are many reasons beyond hormones that influence our skin. As the largest organ of the body, the skin’s primary function (along with the brilliant ability to protect, absorb and regulate temperature) is to detox and filter. Skin is a reflection of one’s internal health. So while we may be bummed about the zit on our nose that no amount of concealer can hide, it is a good sign that your body is serving its purpose. 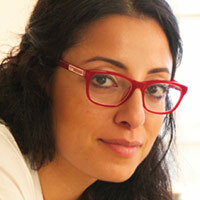 In fact, breakouts can be the perfect invitation to deepen your personal practice in healing. Imagine if you see your freshly formed zit and are able to recognize your kidneys are depleted. Or perhaps the pimple on your nose is just the signal you need to cut back on the coffee and alcohol. Wouldn’t life look differently if we knew how to read our bodies and then respond appropriately? Topical treatments can only go so far. Maybe you’ll be able to rid yourself of that gnarly imperfection on your forehead for now, but without being curious about what lays below it, you may just be going round and round on the acne caboose. This is where face mapping comes in as a way to possibly stop the cycle. Face mapping is a holistic tool that has been practiced for centuries. According to the teachings of Traditional Chinese Medicine and Ayurveda, a breakout can offer insights to the root cause of that pesky pimple. 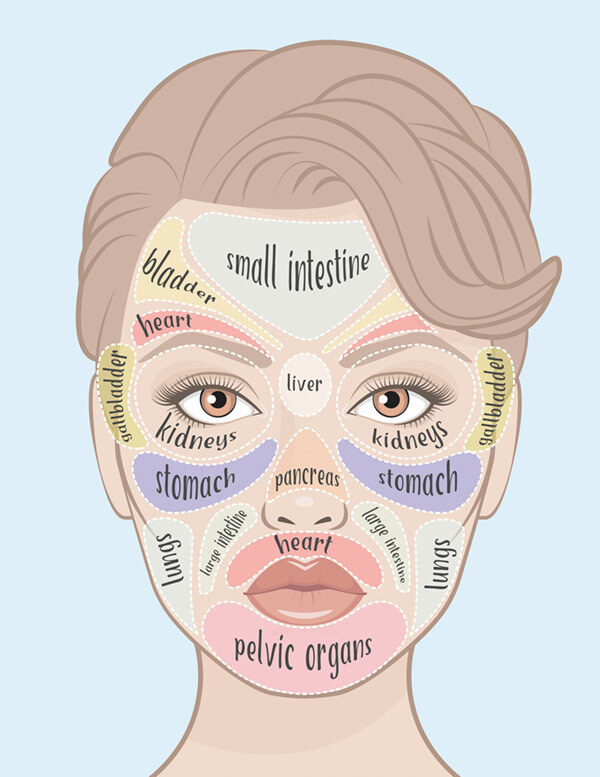 See the Acne Face Map to link breakouts in certain facial regions to specific organs and underlying issues. In Ayurveda, the forehead is governed by the dosha vata, the elemental combination of air and space. This directly connects humans to the nervous and digestive systems, hence our relationship to stress and how we metabolize food. Poor food choices like processed foods can be challenging for the body to break down properly. Likewise, engaging in late night conversations, working long days, and little or poor quality sleep can be stressful to the body. These kinds of behaviors cue the nervous system to be on high alert, which can cause unnecessary breakouts. Adjust bedtimes to get adequate rest. Resting the liver can be a miracle aid for rejuvenating the entire nervous system. Go to bed by 10 p.m. and rise by 6 a.m. for a week. Drink plenty of water. Get the majority of your fluids in before you eat or on an empty stomach. Never guzzle water just after a meal. Drinking liquids with meals dilutes your digestive enzymes, creating work for your body to break food down properly. Also, do not drink a bunch of water just before bed or you will disrupt your sleep. Nix or reduce soda; you do not need it. Get outside for a 30-minute walk. In addition to getting the blood flowing and getting the heart rate up, it can help calm the mind. Get rid of fake sugar and refined sugars. Limit all other healthy sweeteners (coconut nectar, brown rice syrup and honey). Acne between the eyebrows may be a sign that the liver is working too hard. Because the liver acts as a filter for the body, taxing the liver can be linked to the challenges of removing toxins from certain foods you are eating. This may be due to consuming too much meat, dairy or hint at a possible food sensitivity or allergy. Avoid late night foods. Sleeping while your digestive system is trying to break down foods can be a more complicated issue than we realize. Be sure you have at least one to two hours after eating before bedtime. Reduce or avoid alcohol, which can be difficult to process by the liver, especially when it is working on overload. Allowing the liver to replenish and heal helps you process that glass of wine later. Eat plenty of leafy greens and lighter foods to enrich your diet such as salads, soups and roasted vegetables. Try a guided meditation online or sit and follow your breath. Simply sitting still can be an incredible way to rest and reset in just minutes. Eyes say a lot about your joint health, how well you absorb nutrients and if your diet has an excess of sugar or salt. Even if you do not have breakouts around the eyes, you can still get oodles of information on your health and well-being. Puffiness and swollen eyelids can indicate an issue with the kidneys. Kidneys are responsible for removing waste or excess fluid, producing red blood cells (which in turn helps to create energy), producing active levels of vitamin D to keep bones healthy and controlling pH levels. If the kidneys are not happy, it is likely you will feel it. Sweat it out. A good 30-45 minute active cardio workout (vigorous, but not strenuous) can be just what the body needs to eliminate and flush. Cool cucumber slices are an excellent and simple remedy to reduce puffy dark circles. Gently pressing on key points of the face with facial accupressure can help reduce puffiness and eliminate excess fluids. Pollution, smoking, poor food choices and asthma can all contribute to breakouts on the cheeks. It is also possible the body is having a hard time assimilating and/or metabolizing the foods you eat. One way to work with this is to increase your nutrients through freshly prepared green juices. Increasing nutrients and decreasing processed, starchy and unwholesome foods can help kick start your digestive fire and clear up acne on the cheeks. Be mindful of overeating. Even if you are eating healthy foods, too much of a good thing is not a good thing. Learn how to decipher hunger from thirst. Notice how often you snack or eat when emotionally charged or bored. Consider resting your eyes a few times a day. How often are you reading, staring, working or looking? Closing the eyes to rest can be a simple practice to turn in and rejuvenate all the senses. Do not wait for your dentist to tell you how important it is to floss. If you don’t, your cheeks may revolt with a zit or two as revenge. Clean cell phones and pillowcases regularly to stay clear of dirt and bacteria buildup. The nose and cheeks are ruled by the pitta dosha, the elemental combination of fire and water. So if there is excess of heat, a rash or blemish of some kind can likely result in this area. Reduce salt, meat and pungent, spicy foods. It is possible that you already have a good amount of internal heat. Too much heat can have an adverse reaction. Incorporating more cooling foods like cucumbers, squash and green beans can be a great way to bring balance to your inner fire. Increase vitamin B to help the body’s ability to metabolize. Fresh air is good medicine. Go for a hike, head to a body of water or go for a stroll in the woods. Ruled by kapha, the combo of earth and water, the chin and jawline area is the first place you will see an outbreak if your hormone levels are in flux. Reducing stress and getting good quality sleep is key, especially during your menstrual cycle. Pimples may pop in this zone if you go overboard by consuming too many sweets, fats or caffeine. Keep it simple. Slow down and tune in. Look at creative ways to satisfy your sweet tooth by baking sugar-free treats or other healthy twists on old favorites. Work with a naturopathic doctor to have your hormone levels checked and evaluated. Limit wheat, dairy, caffeine and sugar. Look for fun recipes where you can still satisfy your cravings, but with healthy alternatives. Practice self-massage. This is one of the easiest ways to balance hormone levels. When you step out of the shower, use oil instead of lotion to moisturize your body. Spend a few extra minutes at each part of your body to massage, knead and work out kinks for the full benefits. While face mapping can encourage you to look deeper, I find it best as a guide, not gospel. Always seek a medical professional for advice or treatment. That being said, face mapping can be an excellent way to begin a larger conversation. While this list is by no means intended as a diagnosis or one-size-fits-all, it could serve as an invitation to look beyond the breakout into how our lifestyle or habits profoundly affect our body.